From Mexican, to Asian to seafood, find the finest food on the island. Browse restaurants below or select a particular type of restaurant. 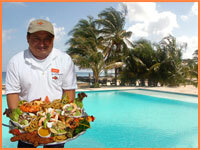 If you can't decide where to eat, why not try our Cozumel food tours instead?! Casa Mission is a unique piece of architecture surrounded by the beauty of its gardens and fountains. The menu includes traditional Mexican and Yucatecan delicacies like Shrimp Cocktails, Lime Soup, Fried Fillet of Fish Veracruz Style, Tampico Beef Steak and Whole Fresh Lobster. On the beautiful island of Cozumel, on and over the turquoise crystal clear Caribbean waters of Mexico, you will find probably Jimmy Buffetts best location yet. Climb up to the look-out terrace restaurant atop Cozumel's highest point - on a small rocky cliff on the island's wild east coast. The best views on Cozumel, hot'n'spicy Mexican menu, fresh seafood and shellfish, cold beers, long cocktails, smilin' staff... do you really need any more reasons to go? Cozumel's most laid-back bar and restaurant. Hammocks, food and drink on the beach on the island's windward side. 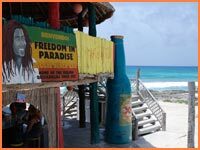 Reggae music and beach grub in the middle of no-where - this place will seduce you! Reggae'n hammocks on the beach. Buccanos is a vibrant restaurant right on San Juan beach at the Club Cozumel Caribe. Showcasing Mexican and Caribbean food with local seafood specialities, it is the ideal choice for gourmet breakfasts, lazy lunches and delicious dinners made with fresh, authentic ingredients. 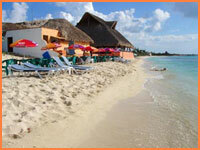 Cozumel beach bar and restaurant with gift shops, horse-riding and ATV tours. Tantalizing Mexican and North American food and zesty drinks. 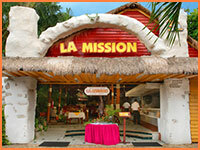 Since 1982, La Mission downtown in Cozumel has been known for its fresh seafood and its excellent Mexican cuisine. The service and hospitality are second to none, with the slogan Si no te gusta, no pagas - "If you don't like it, you don't pay". New bar and restaurant at Dzul-Ha beach. Friendly atmosphere, crystal clear water, great views. Live music many nights, great for events too. The Miramar Terrace offers a romantic spot to watch the sunset on the island. El Sazon Del Camaron, meaning 'The Seasoning of the Shrimp' - is a great little daytime seafood restaurant that's popular with locals. They serve tacos (filled maize flour tortillas) and tortas (bread roll sandwiches), with fried breaded shrimp, fish, octopus, conch, ceviche (local marinaded seafood speciality) and more. Sushi restaurant with home deliver service or eat in. Good selection of fish, meat and vegeterian dishes. Location: Calle Salas between Avenida 15 and 20. The house specialty is tacos, however, they also offer a large variety of local dishes and seafood. Recommended by locals for its great taste and affordable prices. 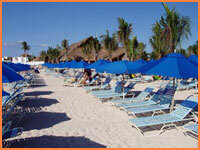 Popular Cozumel beach with well-kept facilities. Friendly service, good food and beautiful white sand. Their specialty is tacos, but their soups and other items are great too. Order one of the El Foco specials for about $8 and it will feed two people. Beach shack style bar and restaurant with incredible windward side views on Playa San Martín. A favorite of divers and locals, it has been discovered by tourists due to its excellent food, good prices, and frequent mentions in guide books. It is a bit far from the center of town, but well worth the trip. Fresh seafood of all types, the seafood platter is huge and will feed two persons with average appetites. The giant Margaritas and piña coladas are good, but beware driving afterwards. Kids love the video games in the back. Los Otates, traditional maize tortilla tacos with a variety of delicious meat fillings. Local rustic atmosphere. Other local specialities also available. Location: Avenida 15 between Calle Salas and Calle 3. Small, rustic restuarant with excellent lobster and other seafood dishes. Location: Corner of Avenida 5 with Calle 7. Ceviche and fried fish are the main stays at this neighborhood restaurant and seafood market. Crowded with locals and families, definitely worth a taxi ride to sample their delicious fish. This popular restaurant and bar is right on the main square downtown, so it's always busy with island visitors and locals alike. The menu is traditional Mexican, with dishes such as enchiladas, fajitas, tacos, guacamole, fish and steak. You can eat inside in the cozy dining room or out on the terrace overlooking the square. Great on Sunday evenings, when live music plays and people dance in the plaza. Location: Parque Benito Juarez (main square) - south side. Possibly the smallest Hard Rock cafe in the world! Great for food, drink and - of course - music. Complementing the usual rock music paraphernalia is an original ceiling mural of a vast underwater setting. Location: On the seafront downtown (Av. Melgar), between the Main Square and Calle 2, in front of the ferry pier. Opening hours: 10am - 1am, daily. Caribbean café serving breakast, lunch and dinner. Sandwiches, shakes, burgers, salads, desserts and more. Eat-in, take away or home delivery. Opening hours: 7am - 10pm, Sat. 7am - 2pm. Location: on the seafront (Melgar) between Calle 11 and Punta Langosta. Fast cheesy pizzas to eat in, take away or delivered to your door. Location: Avenida 3 between Calles Salas and 3. A tantalizing selection of Mexican and Mayan dishes, including favorites such as sizzling fajitas and grilled shrimp. Excellent service, located in a charming hidden courtyard setting. Location: Seafront (Melgar) between Calles 8 and 10. Opening hours: Mon-Sat. Lunch 10.30am - 5pm. Dinner 5pm - 10.30pm. Formally known as The Coffee Bean, this is the best place in Cozumel to get your caffeine fix. Rich, aromatic fresh ground coffee and other drinks, from espressos to chai tea, to hot chocolate. Yummy home baked pastries and cakes. Popular place for breakfast and a chat with friends. Opening hours: 8am - 11pm, daily. Location: Calle 3 between Avenida Melgar (seafront) and Avenida 5. Enjoy the Caribbean sea breeze and a stunning turquoise ocean view from the café on the first floor terrace at the island's museum. Located on the seafront downtown, watch the people and ships go by as you enjoy traditional Mexican egg dishes for breakfast, such as huevos rancheros, as well as pancakes, waffles and fresh fruit. Lunch is sandwiches, salads and fresh juices. Location: Avenida Melgar (Seafront) between Calles 4 and 6. Serving food on the square downtown for over 90 years, this is surely Cozumel's oldest remaining restaurant. Original recipes from the Yucatan region of Mexico, including tacos and empanadas. Historic building full of intriguing photos including some of Jackie Onassis and Plácido Domingo who dined here in the past. Location: Parque Benito Juarez (main square) corner with Avenida 5 and Avenida Benito Juarez. We have never had a bad meal here, whether it was breakfast, lunch or dinner. We get the same report from other Cozumel frequent visitors. Breakfast for two including eggs, meat, beans, and coffee runs around $6–7 USD. The conch and the lobster also get high marks as does the Mexican platter for two. Bring them your catch when you fish, for $2 USD they will cook it up and serve it with side dishes. The French Quarter's casual atmosphere, central location and great food make it very popular. Dine upstairs under the palapa roof, in the comfort of indoor air conditioning, or downstairs at the tables around the bar. The menu offers everything from fresh seafood, to Angus steaks to Cajun dishes, including gumbo, étouffée and jambalaya. Location: Avenida 5 between Avenida Rosada Salas and Calle 3. Formerly known as Jeanie's Waffle house, this beach front restaurant downtown serves American-style breakfasts and dinner in the evening too. Take in the ocean views as you enjoy your meal. 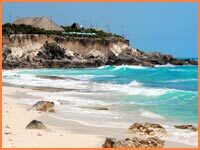 A small beach is also available and snorkeling is possible. Opening hours: 6am - 10pm, daily. Location: Avenida Melgar (seafront) corner with Calle 11. No other restaurant in Cozumel offers a menu quite like La Cocay. Their creative chef frequently changes the dishes on offer and serves up delicious Mediterranean-inspired delights with a Mexican touch, such as shrimp tomato and artichoke salad and sauteed sea scallops with a cognac glaze served with rice pilaf. Enjoy fantasic views from this nautically themed ocean front restaurant. Try house specialties like chateaubriand, prime rib, T-bone steak, caesar salad and flambé desserts. Reservations are recommended especially when many cruise ships are in port. Location: Avenida Melgar (seafront) corner with Calle Rosada Salas. Each listing can contain up to 200 words, 10 photos and contact details including a link to your site. Design included. Delicious Italian pasta, pizza and other dishes. Extensive wine menu and garden courtyard setting. Location: Avenida Melgar (Seafront) between Calles 6 and 8. This is your basic Tex-Mex, that said, it is terrific Tex-Mex. Serves some of the best shrimp nachos and fajitas we have ever eaten. Noisy and fun, beware of the tequila shooters. All we can say is yummy! They have awesome shrimp tacos here made with big shrimp and not those tiny shrimp. Good pork tacos and he even offers lobster tails at times if you ask. You can even check in at the airport and then go to Diego’s to eat. The food here is absolutely excellent. The chimichanga and chili rellenos are outstanding. Breakfast offers Mexican and American dishes plus the staff accommodates special requests. Lunch has a selection of authentic Mexican dishes as well as North American style sandwiches and burgers. In addition to the dinner menu, the restaurant offers theme nights. There are not many restaurants in Cozumel that offer such great ocean views. Now this is a genuine grill! Open flame cooking over real wooden logs. Grilled veggie on skewers and true Argentinean beef. The grilled fish is also a treat and at a great price. This inexpensive seafood restaurant serves up the yummiest fried shrimp tacos for around a dollar each. This is dining, a very popular locals place. They offer Mexican style smoked marlin, ceviche, fillets, shrimp and lobsters. The Wallenta brothers, Kris and Jason, have hit another home run with this new dining experience. True Mexican cuisine with an upscale touch. Service is just as great as it is at Kinta. Once again a fine dining experience at moderate prices.The ambiance is sophisticated yet casual. Kondesa is sure to be as popular as its sister Kinta. Bring a coupon from Cozumel the Complete Guide II (see below) and enjoy a glass of their tasty sangria free with the coupon from “Cozumel the Complete Guide. The name translates to The Turtles. This is a traditional Mexican restaurant, you will not find Tex-Mex here. Try the conch ceviche, we're told it is very good. When you enter this restaurant you will swear you have been transported to old Italy. The ambiance is almost seductive. Sorrisi's owner and the entire Chefs crew are actually from Italy. Most of their supplies for your dinner are also imported from Italy. Meal choices range from basic pizza to gourmet dishes. The sangría is some of the best we have ever tasted. This place is jam packed with locals by midafternoon. Serving homemade Yucatan food worth far more than the price they charge. You get a choice of soup, choice of 3 entries, which change daily, rice or spaghetti and veggies or potatoes. Also comes with a cold drink of jamaica (a tea made from hibiscus). Be sure to try the chicken cutlet stuffed with ham if it is available. They also serve a good breakfast, and it is one of our favorite places to start the morning. They serve some of the best tacos al pastor on the island. Two people can eat for $6-7 including sodas. Try the Al Pastor pizza for a real flavor treat. This is another family run restaurant on Cozumel; el Abuelo Gerardo means Grandfather Gerard, the patriarch. 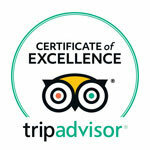 We have received mostly good reviews on this little place but have had both good and bad service here. Considering the reviews, we suggest you give it a try. You can either dine in the back garden or in the dining room where you can people watch. The lobster is priced in the teens and we enjoyed it when we ordered it. This is not just one eatery, but various small open-air restaurants around El Mercado (the market). They get crowded at breakfast with locals and visitors who know how to stretch their food budget. We have eaten breakfast at several of them for under $3 and have had several excellent lunches here also. We tried this little hole in the wall place and were impressed. They have take-out and delivery only. We ordered sweet and sour chicken, fried rice, and an egg roll - everything was delicious and cost under $3. Here is another terrific cocina económica (economical kitchen) with a big bang for your peso. No English spoken, but it is worth the effort to eat here. $3-5 gets you soup, entree, and drink, with a choice of 5-6 entrees daily. The Sopa de Lima is highly recommended - some of the best Yucatecan food on the island. This is probably one of the best breakfast options in Cozumel. They have a lot of choices and the fresh juices and smoothies are delicious. Everything is made fresh and the servings are sometimes enough for two. Try the Nambi fish, a wahoo filet with mango chutney and banana tostones with Caribbean salad for lunch or dinner. It is nothing special to look at but well worth the trip. Go there for meat called arrechera: there is national and international style, both are very good. Feel free to order off the menu but we recommend for 2 people is 1/2 kilo of national arrechera meat with your choice of a baked onion or baked potato along with salsa, crema, avocado, lime and fresh tortillas. This allows you to make the best tacos ever! Always packed full of people, it is also a good place to buy your meat for a BBQ at home (it is a butcher shop and restaurant), just fantastic. This quickly became one of our favorite places for a snack or light meal. These empanadas are not what you would expect in Mexico, they are made of special dough and filled with all kinds of mouth-watering flavors. The tomato, basil and cheese are a favorite, but they are all excellent. They also deliver if you desire. Rene is the owner and chef and is a pleasure to speak with. Since changing to this location his menu has expanded to steaks and other food from the grill. His following expanded along with his menu and you may have to wait for a table. 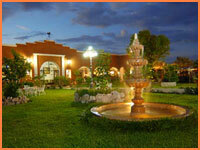 Located in a residential area serving Yucatecan dishes. A very simple establishment with excellent food and a friendly smiling staff. Our favorite dishes here are the Panuchos (fried tortilla with chicken and avocado), and the chicken in black chili sauce. This is another relatively new addition to Cozumel that is quickly becoming popular with both Mexicans and expatriate locals. They have some great beer and drink specials with 2 for 1 mixed drinks from 5-7pm. They have inexpensive offerings on the menu, with free salsa and chips from 11am-5pm. This is fine dining at affordable prices. Kris Wallenta is one of the most original, inventive, and fantastic chefs. He blends his spices, cheeses and other ingredients into flavors one would never imagine. The menu is changed every 3 months so you will never get bored, as if you could. Be sure to save room for desert and try his Mexican version of Crème Brule. Bring a coupon from Cozumel the Complete Guide II (see below) and enjoy a glass of their tasty sangría free. A local taqueria serving tacos al pastor and gringas (pastor with added cheese). Five or six of these plus a soda and you have dinner for under $4. This is a very popular dining place for the locals. Daily specials include soup, entree and drink for under $5. A bit more expensive, but still cheap is the shrimp brochette, a grilled shrimp dish that is outstanding. Serving some of the best seafood on the island for reasonable prices. The ceviche and seafood soup are both great to start a meal with, then have the catch of the day. This is a delicious change from the other restaurants. They use all original recipes with their special touch. Our favorite is the Mahi-Mahi encrusted with black and white sesame seeds. You can dine in their unusually decorated air conditioned dining room or enjoy the Caribbean air out on the porch. They usually have live music on Friday and Saturdays starting at 9pm. This is a great little sports bar serving both Mexican and American food. They have a special of the day for under $6 at lunch. Karaoke can be enjoyed on many evenings. You have only two choices to pick from here, both delicious, quesadillas and huaraches (folded over tortillas). Choose your toppings and fillings from behind the glassed in case, just point as needed. A favorite here is the nopales, which is cactus, very good, give it a try. They serve comida corrida until 5pm and then they re-open at 7pm with a full menu including pizza, Italian, seafood, pastas and Chinese dishes as well as Mexican food. The spicy tangy honey glazed Ahi Tuna is recommended, served Cantonese style over rice. Yummy grilled chicken with bags of rice, salsa, onions and lots of corn tortillas. They close when they run out of chicken... it can be as early as 3pm or as late as 7pm. Prices are inexpensive and the chicken is grilled over a wood burning fire. The food is good and the menu is long, but the company of Miguel is what will bring you back. He is a perfect host, entertaining and friendly. Ladies, if the music is playing in the park ask him to “salsa” with you. OK, back to the food. International and Mexican dishes, steaks and seafood, and it is all good. If you don’t see it on the menu, ask. It is a great place to sit and watch the band in the park. Rolandi’s is a franchise and if you have dined in Playa del Carmen or Cancun you already know how good the food is. 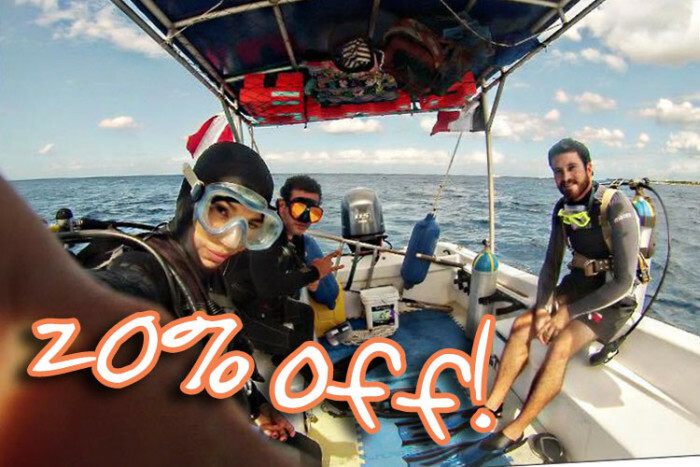 This newest edition to Cozumel has been long awaited by many visitors and locals alike. Located on the waterfront the view is stunning and reason alone to dine there. They have a long list of pizza types and a great pasta selection. In addition to that they have many other choices. They also have a fairly wide wine selection. The only negative here is the overlapping music from Margaritaville next door, mainly in the afternoons. Visit this great place for one of the biggest beers on the island or one of their other refreshing signature adult beverages. Be sure and try the (quickly becoming) famous Italian Melt sandwich with a side of homemade fresh daily Pasta Salad, you won't be sorry you did! Excellent seafood and Mexican dishes, but the big draw here is the Mexican Coffee prepared at your table. Coffee, tequila, coconut ice cream and cinnamon, simply delectable. Enjoy some good food and good drinks, at good prices. They have subs, sandwiches and Mexican snacks. Frozen drinks are 2 for 1 all day at only $5, no tourist prices here. 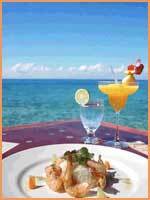 World cuisine served in an intimate setting, a must visit while in Cozumel. Adrian is the owner and chef at this fantastic little place. He is a member of the Casa Denis family and was probably born cooking. Argentinian and Mexican dishes, his meals are of gourmet quality, how he serves these dishes at these low prices is a mystery. Build your own burrito, torta or taco! Choose from several delicious ingredients and everything under $5. These guys are fairly new, but have quickly gained a following of both locals and tourists. Serving the traditional Mexican fare of tacos, fajitas, and other yummy dishes, you will not have to break your piggy bank to dine here. Typical home style Yucatan cooking. The pozole comes highly recommended. Tuesday is chile relleno day, get there early because they have some of the best on the island and can run out quickly. Each Sunday they make their special lasagna for around 60 pesos. Their usual selections are pasta, pork, chicken, shrimp and salad dishes. You will be pleased with a very inexpensive bill. This is a rotary-roasted chicken place cooking over the wood fire. You can buy quarter, half or whole chicken. It also comes with side dishes and tortillas. Tasty Chinese food at reasonable prices. Frequented by the crews from the cruise ships, so you know it's good. Recommended for breakfast. Good food, moderate prices. We hardly ever see tourists here, although some must visit as their menu is available in English. Great eggs with green sauce and wonderful juice, makes for the perfect start to your day. This is personal favorite of the author's fussy son. Terrific place to people watch, as it is right on the corner of the plaza. Serving many Yucatan specialties, but the nachos with chicken is really tasty and the serving is large. Don't forget to purchase the Casa Blanca souvenir, a painted tile with Señor or Señorita and your name and Casa Blanca on it. European dishes like pan-fried braised beef pierogies, falafel with grilled flatbread, shrimp and scallop ravioli, and coconut curry shrimp. Most dishes you will not find elsewhere on Cozumel. We have heard that it is a must to save room for their citrus tart. They have so many great things here that it is hard to choose: olive and blue cheese tapenade, the seafood capriccio over mashed potatoes and the lobster and bacon sandwich, just to name a few. Many wine drinkers say they have the best wines on the island. Be adventures and eat breakfast like a local. Serving some of the best seafood tacos and sandwiches in town. Eat in or get them to go and take them on the boat or to the beach for your lunch. This is a very small place seating about 20 people that serves tasty Thai food at inexpensive prices. A great place for a quick lunch or maybe a take home dinner. They also deliver for those of us who are too lazy to venture out or away from the pool. Mosaicoz can be tough to find, because it is in the restaurant gauntlet on the way to Casa Denis. This place has truly cheap beers, at around a dollar a bottle and they'll bring you complimentary chips and salsa. The salad is enough for two and they are one of the best salads on the island. We get the wood fired "Belize" pizza with a very thin crust and lots of veggies and chicken. After your first visit to Kelly's you will have found a home away from home. A favorite hangout of frequent visitors and expats who gather to tell tall tales and watch sports. Menu items include: chilidogs, Reuben's, giant burritos and some other specialties you won't find anywhere else. A great place to stop in and have an evening snack of salbutes (small tortillas with a variety of toppings), or some tasty panuchos (tortillas filled with beans and topped with lettuce, tomatoes, onions and meat). Can you say Denny's in Spanish? But then we like Denny's! The food is pretty good and the fried fish was extremely good. Get a street front table for breakfast and people-watch as all the cruise ship tourists descend and the ferries unload. This is definitely the place for dinner during Carnival, get there early and have a very long dinner, and a front seat for viewing the parades. 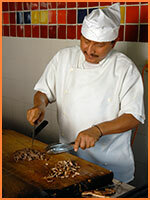 Here is another popular cocina economica (economical kitchen) with home style Yucatan cooking. For about $5 you get soup, entree, rice, veggies and drink. Eat in the dining room or enjoy your meal in the garden. Owned and operated by a wonderful couple; this is a great place with great margaritas, good food and a fun staff. The treats are the most imaginative margaritas in the world and the food is also excellent and fairly priced. See suggestions for Mexican food or select a different type of restaurant. See suggestions for Italian food including pasta and pizza, or select a different type of restaurant. See suggestions for pizza, burgers, chicken and more fast and economical food - to eat in, take away or home delivery - or select a different type of restaurant. See suggestions for Chinese, Japanese, sushi and more, or select a different type of restaurant. See suggestions for cafés, international, fusion and other culinary delights, or select a different type of restaurant. See suggestions for lobster, fish and other delicious fresh seafood or select a different type of restaurant.